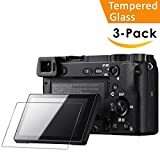 This Tempered Glass Screen Protector fits perfectly for Sony Alpha NEX 7 / NEX 6 / NEX 6L / NEX 5 / NEX 3N / A6300 / A6000 / A5000. NOT FOR A6500 OR OTHER MODELS!!!. Note: Peel off your original thin protective layer firstly, then replace it with QIBOX glass screen protector.